This is a wildly unpopular thought but I have post-vacation hangover so I will just come out and say it. I really don't like summer - it actually causes me a good deal of anxiety. It's the one season where I am conscious of my weight every minute of the day. It's also the season for so many changes in schedule (school to no school to summer program to end of summer program, vacation somewhere in-between and then school again). I am a girl who likes her routines. You can argue and say that some people will just excel and some people will feel left out- such is societal nature. But guess what? In the world of toys, there are a strong few that challenge this cruel rule of nature and will actually be good for just about any kid and has the potential to bring kids together. 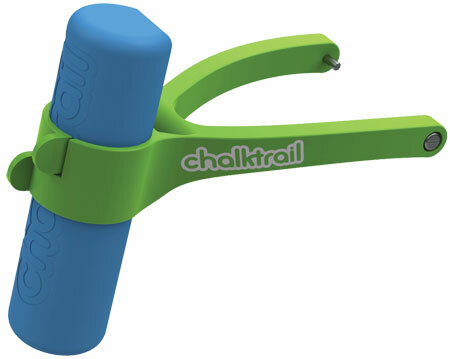 Chalktrail is one of those toys. This goes for the bike attachment that we've had since last year (works like new- STILL), and the new scooter attachment that we've been enjoying this year. Believe it or not, I had to adjust the settings as my camera doesn't pick up pink so well. 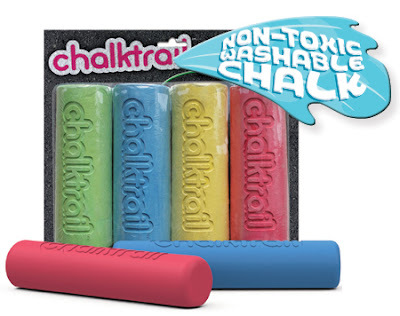 But the good part is that kids can adjust their chalk at different angles to learn how to make a darker mark. I really like that. First off, whenever you attach anything to your outdoor toy, that makes it more fun. Like those baskets and bells on bicycles, chalktrail is a functional add-on that puts a smile on kids' faces. I think of it as an I've-Got-Work-to-Do component that both kids and adults rely on to wade through social seas. 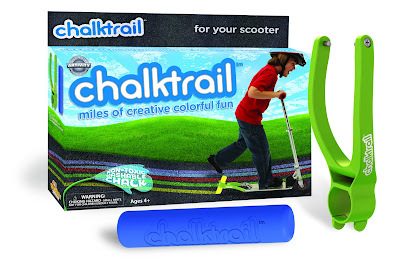 How cool is this kid using Chalktrail Scooter for the first time! This kid is more Harry Potter Bookworm than Scooter Stuntman but today Chalktrail shows him that he can be both! My oldest is quite capable on his scooter and once he did something that I really wish I could have caught on camera but I failed that day. What happened was, he started using his friend's chalktrail and then he ended up making a squiggly line by alternating his "pushing" foot from which side of the scooter to the other. But by pushing at a quick but steady pace, he was able to make tight same-sized curves in his wavy chalkline. It was really cool. I hated myself for losing battery on my camera that day! But please forgive me for not "making" him do it again for the camera. Gotta give these toy testers a break sometimes... it's not good testing if play becomes work. Irregardless, whether or not you're making a squiggly line, kids who are speedy and graceful on their bikes and scooters can really challenge themselves further. With really well-designed active toys, I think the challenge is intuitive. 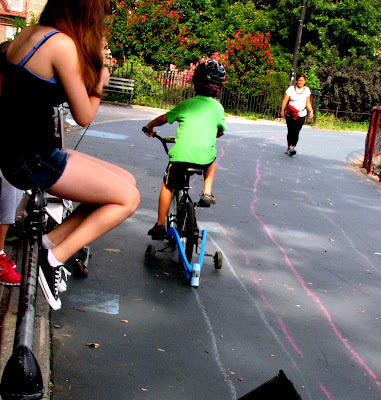 Kids who are skilled at riding will think of a shape and try drawing it. It's a natural next-step. For those who aren't, creating that record-breaking long line or drawing scores of rings around the track will leave them feeling confident. How could it not? While my son put together the bike attachment by himself, my husband had to be the one to set the scooter attachment up. You need some elbow grease but once you're done, your child can put it on or take it off his scooter all by himself. 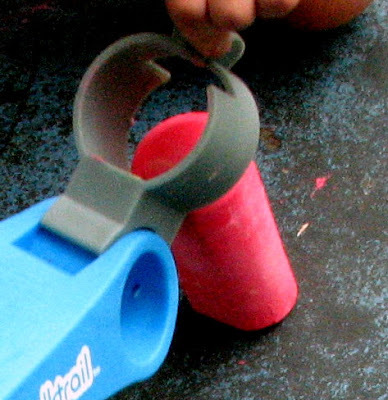 This is an active toy that is very easy-on, easy-out! We all need to mix-up our routines! I think many of us feel that creativity is something that takes place indoors. Outdoor play is usually relates to ideas of improving physical agility or burning calories.. wouldn't you agree? But if you think about it, when kids are pushing their abilities to the next level, it usually comes in the form of creative play. Don't we hear this outdoors often, "Hey, watch this!" as some creates a "new move" with his skateboard. Kids will hang upside from the monkey bars in some creative acrobatic pose that "no one has ever done before." 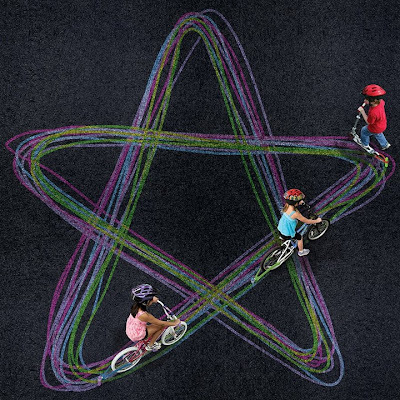 From 1:11, you can learn how Scott Baumann came up with the idea for Chalktrail. If you have an inventor kid at home, show him this clip! Kids are usually not developing their skills to reach age-appropriate gross motor goals. They are not making rings around the track because they think it's good to improve their visual motor skills but they can't help but improve these skills as they continue to play and wow themselves with their outdoor toys. Can you think of a toy better than Chalktrail to give kids a tool to surprise themselves and their friends WHILE concurrently giving them opportunities to exercise and further develop physical agility and strength? 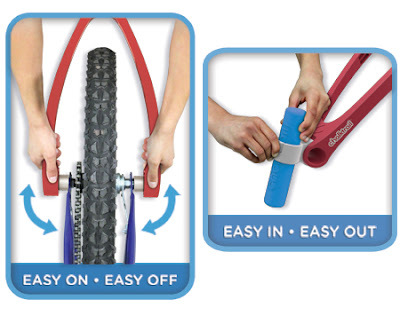 To make this even better, this simply brilliant toy has an extremely simple price. It is less than $13 for the scooter attachment! Note to parent: You have to bring your own scooter. Believe me, you will have a really tough time finding something comparably priced for a scooter. Heck, you'll have a really tough time finding anything like this for a bike or a scooter. 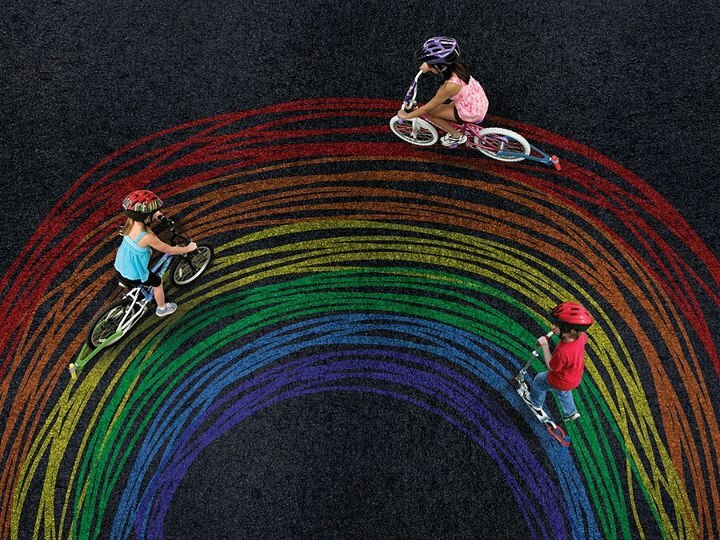 I don't know what else to say except that to say that to me, given the price, the design, and the subsequent magic that can occur, Chalktrail is one invention that really shows kindness to kids and their families. I have to get my kid to stop using his chalktrail to draw (with his hands). 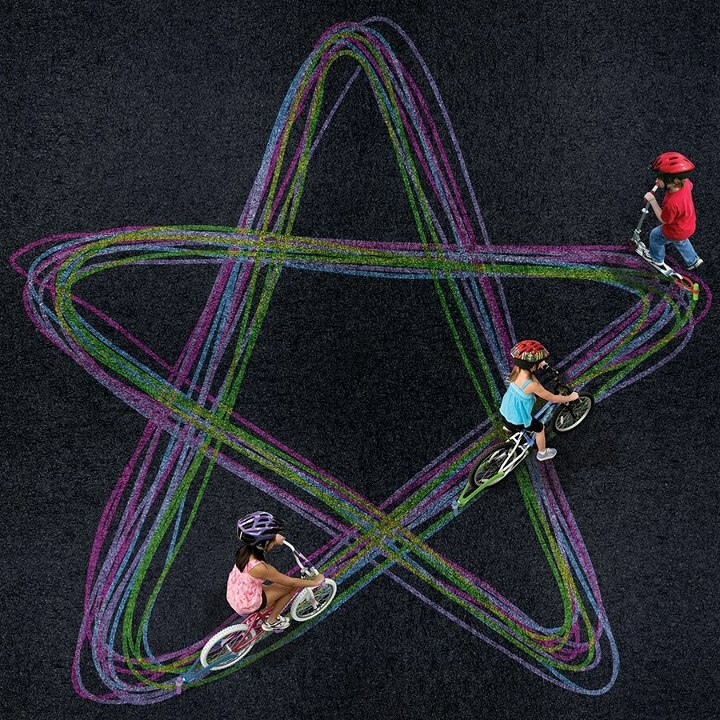 Once they start drawing with their bikes, don't be surprised if they start drawing with their hands. Bring regular sidewalk chalk or save your "stumps" for such times. If you are getting one for yourself or buying this as a gift, you really must get a pack of chalk too. It just makes everything more fun. My fave color is the pink. It's radiant! MORE- I like videos with good music. 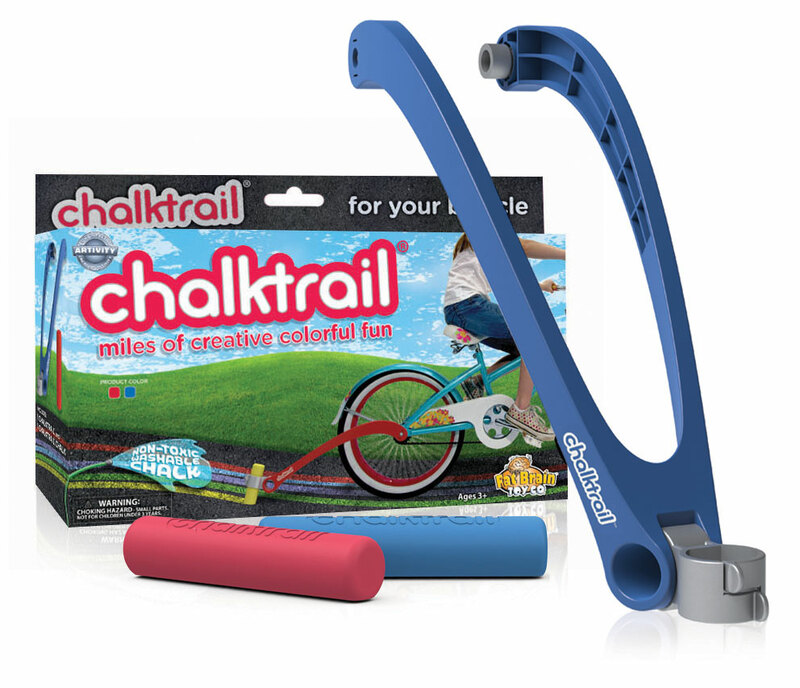 MORE MORE: Here's last year's coverage of Chalktrail and how it proved to be "Creative Evidence of Exercise"
And now try out to win your own Chalktrail Scooter or Bike (Your Choice!) How cool is this? Want to get it on Amazon? I found some... Use Amazon links to support Toys are Tools - or bookmark this link whenever you want to shop on Amazon to support me! Together we can continue thoughtful toy reviews to see another playful year! PREVENT CHILDHOOD OBESITY- the epidemic is real! I love the super sand digger! I remember having one of these as a kid - I spend hours playing with it!